During Microsoft's Windows 10 launch event yesterday, one thing became clear: Microsoft is absolutely desperate to banish the dual-interface confusion that made Windows 8 (though not so much Windows 8.1) a joke. With the move to a more unified UI, I can't help but feel like Microsoft is turning a little against touch with this release – even if there are still numerous touch features present, but Windows 10 handles touch differently than Windows 8. Could Microsoft yet reveal a tablet version of Windows Phone 10? It's possible. One thing's for sure – Windows 10 does mark a new beginning; a unified OS across various devices and Universal apps, too. The idea is that the new Windows will work on basically any device, maybe including ARM devices. Microsoft wouldn't be drawn on it, instead preferring to talk up Windows Phone 10 as its ARM option, but if Microsoft wants Windows on every device, it will have to offer an ARM option for full-on productivity tablets. Windows RT was the OS for ARM devices that was meant to change tablets. It was pretty much dead on arrival (which we always said it should be) thanks to a total lack of sales and manufacturer support. RT has now disappeared into the great recycle bin in the sky, along with the Windows 8 task switcher and possibly charms as we knew them. But the good news is that Universal apps mean the line between Intel and ARM devices should be broken down in future – as well as the line between devices that have touch and those that don't. As Microsoft's Terry Myerson says: "Windows 10 will run across an incredibly broad set of devices – from the Internet of Things, to servers in enterprise data centers worldwide. Some of these devices have 4 inch screens – some have 80 inch screens – and some don't have screens at all. Some of these devices you hold in your hand, others are ten feet away. Some of these devices you primarily use touch/pen, others mouse/keyboard, others controller/gesture – and some devices can switch between input types." That's why the new Continuum feature is absolutely key to the success of Windows 10 – the OS being able to adapt the user interface depending on the type of input and the type of display it is attached to. It's a very Apple-style feature in name as well as seamless function (well, it's designed to be seamless) but should bridge the gap between the increasingly diverse community of Windows devices. As Mary Branscombe says in our hands on review, Microsoft is trying to strike a balance for every kind of user with Windows 10. And that includes business and enterprise – yesterday's event was designed specifically to signpost Windows 10 for these types of users, some of whom are persevering with the non-supported Windows XP while others wonder where they will go after Windows 7. There were some interesting developments for those types of users, especially around device management and the ability to customize enterprise app stores and ensure that personal and corporate data don't mix. But the event didn't go that heavy on the detail so enterprises will certainly need to check out Windows 10 and its associated tools themselves. One key benefit is that corporates will be able to choose between Windows Group Policy and Mobile Device Management (MDM) for the management and deployment of all Windows devices – even bog-standard beige-box desktop PCs. That even includes the management of what users do with their data. The Bring Your Own Device (BYOD) culture that's pervading through our businesses is also leaking data left, right and centre. According to a recent survey by PwC over 56% of UK companies have mobile security strategies – higher than the global figure – but 18% say they do not have any controls in place over the devices that enter into their businesses. Developers, on the other hand, have a lot to celebrate with Windows 10's Universal apps (although we knew this One Microsoft-derived idea was in the pipeline). This is also key to the multi-device future of Windows 10. There will be one app store across all devices including mobile and Xbox and apps will run on all sizes of device and in all environments (desktop and Modern UI). Apps will update across all of the devices and be simpler to administer. 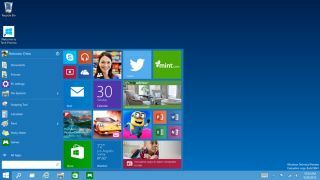 Right now, Windows 10 isn't that different to Windows 8.1 for consumers. Yes, the new Start Menu should assuage some users coming from Windows XP and Windows 7, but there is precious little polish in the Technical Preview build. That's OK – Microsoft has two thirds of a year to add all that in. Microsoft cites 14% growth in shipments of enterprise PCs during the first half of 2014 alongside a rise in enterprise tablet shipments of 33%. It is those users Microsoft desperately wants to target with this new OS as it endeavours to persuade them away from older products. Microsoft is not only offering a Technical Preview of the OS itself, but is also releasing technical previews of Windows Server and its management tools, too. So does Windows 10 see Windows getting back on track? Probably. But Microsoft has a big challenge in persuading people that it is serious about Windows 10 as a corporate tool as well as something that consumers should want to upgrade to, whether they're converts to Windows 8 or they resolutely stuck with Windows 7. And that's before you mention the millions of people still persevering with Windows XP - the operating system that simply won't die. Truth be told, Microsoft still needs to bridge the gap back to those guys, too.